Halloween is a day in our country when both the young and old find fun in death and what is scary. Many children set out to find the scariest costume to wear for their school parade and trick-or-treating. With so many visual symbols of death set before our children at this time of year it is fitting to teach them about how children of God have no need to fear death. This lesson walks children through a passage from the book of Matthew to help them see how death is not a scary thing for the believer. It could be used in Sunday School, but would be ideal for a Halloween Children’s Church lesson. For younger children, the My God is So Big Song would be a good addition. 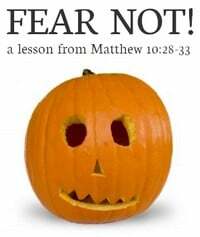 Learning Objective: The children will learn how a child of God does not need to fear death. Time Needed: 20 minutes, plus time to meet with children following the lesson to discuss their salvation. “What are some things that come to your mind when you think about Halloween?” Take input from the children. Read aloud this passage while the children follow along in their own Bibles. “Let’s read verse 28 again.” Have a child read it out loud. “Who is ‘him who can destroy both soul and body’?” God. “Can people destroy your soul?” No. “Can Satan destroy your soul?” No. “Does our soul live forever even when our body dies?” Yes. “Now look at verse 29-31.” Have a child read these verses out loud. “Does God care for little baby sparrows?” Yes. “If God cares for little sparrows, then how much more do you think He cares for His own children?” A lot! Have a child read aloud verse 32. Have a child read aloud verse 33. This would now be a time to present the gospel and/or allow the opportunity for children to meet with an adult leader to discuss the state of their salvation. This is the perfect lesson for Junior Church this Sunday before Halloween. Thanks so much. Tony Kummer (Editor) reviewed & updated this page on : November 1, 2018 at 11:53 am. All our content is peer reviewed by our readers, simply leave a comment on any post suggest an update.